The Mitsubishi Outlander is a three-row crossover that everyone forgets even exists, but it actually offers outstanding value. What do you need to know before you buy a Mitsubishi Outlander? Don’t worry, we’ll tell you everything right here in our Buyer’s Guide. I mean, yes, [the RDX is] a better car, no question. But when it comes right down to it, in actual use in real life it doesn’t do anything so much dramatically better than the Mitsubishi. [...] The Mitsubishi Outlander isn’t particularly great, but it’s not awful, and if you can find one cheap I’m sure it’d do what you needed it to do, well enough. Mitsubishi has made some significant changes for the 2016 model year, so it might now offer even more value than it did when we wrote that comparison. So don’t write off the Mitsubishi if you just need a big crossover that goes down the street in an uneventful manner. Pay the Mitsubishi dealer a visit. He’s probably very lonely these days. The third generation Mitsubishi Outlander made its U.S. debut at the 2013 LA Auto Show. The new crossover got new styling, making it look a bit more generic and less like a Mitsubishi Lancer on stilts. Mitsubishi’s new seven-passenger crossover brought long-overdue interior updates, and also lost about 200 pounds compared to its predecessor. That, combined with a lower drag coefficient, new more efficient electronic power steering, and tweaks to the 2.4-liter I4, 3.0-liter V6 and continuously variable transmission, yielded significantly improved fuel economy. 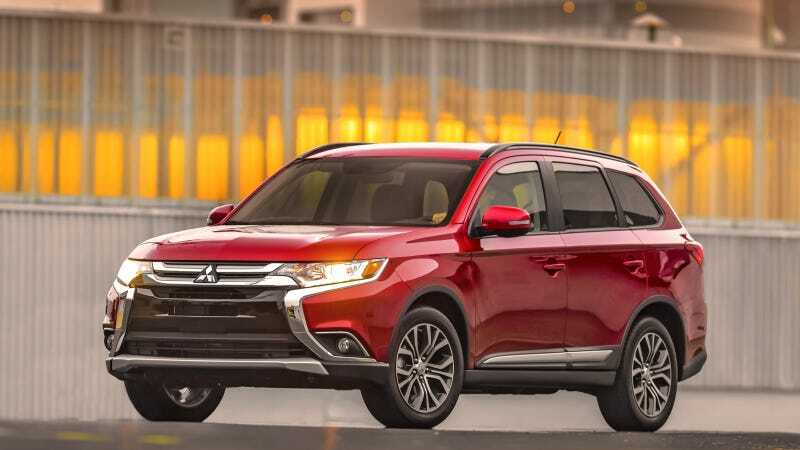 Mitsubishi also bragged about the new Outlander’s sound insulation, saying it helped make the new Outlander “exceptionally quiet.” On the handling front, the third-gen Mitsu CUV received new front shocks and springs, and new control arms at the rear. Rounding off the major changes was the addition of driver’s assist features, which are all the rage these days, particularly among CUV buyers. The 2014 Outlander offered Forward Collision Mitigation, Lane Departure Warning and Adaptive Cruise Control. The following year, Mitsubishi gave the Outlander a new front upper grille, and new exterior trim around the bumpers. It also got improved sound insulation, standard leather-wrapped steering wheel and shift knob, and a hands-free phone system. Those improvements include a stiffened unibody, tweaked suspension, revised electric power steering system, thicker rear door glass, new “dynamic dampers,” and a new continuously variable transmission. The Mitsbubishi Outlander comes in four main trims: ES, SE, SEL and GT. The GT with a 3.0-liter V6, six-speed and all-wheel drive (called S-AWC for “Super All Wheel Control”), while the other three trims come standard with front-wheel drive and a 2.4-liter inline-four mated to a CVT, though all-wheel drive is optional. Steering is electric, and brakes are single-piston calipers grabbing discs all the way around. The front discs are vented and 11.6-inches in diameter, while the rears are solid 11.9-inchers. Suspension is a MacPherson strut design up front and a multi-link independent setup in the back. If we needed a really cheap seven-passenger SUV, we’d take a look at the SEL trim. At $25,845 with destination, it not only gets decent fuel economy, but it still has niceties like leather seats, power driver’s seat, heated front seats, 6.1-inch touchscreen display with rearview camera, automatic dual-zone climate control, fog lights, heated mirrors, roof rails, 140W six-speaker audio system, automatic headlights and 18-inch alloy wheels. That’s quite a lot of equipment for not a lot of coin.